Easter Party, the theme of this month. Don't you get curious about what's in there? Come with me to check it out! 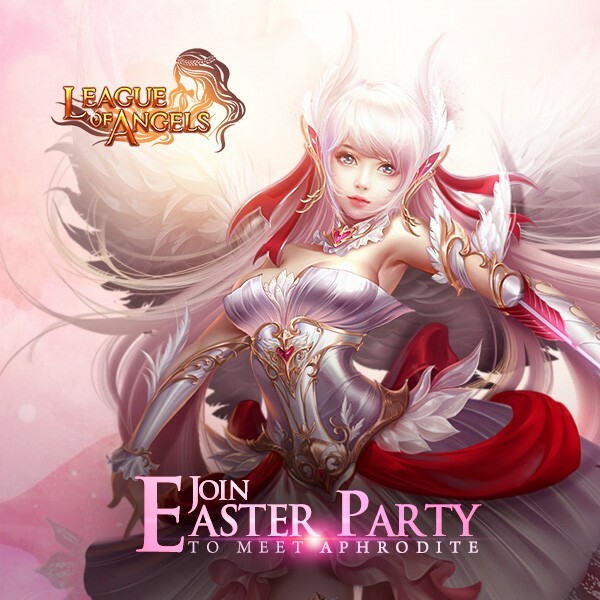 This is the button of Easter Party, click it. Ready? Let's go! 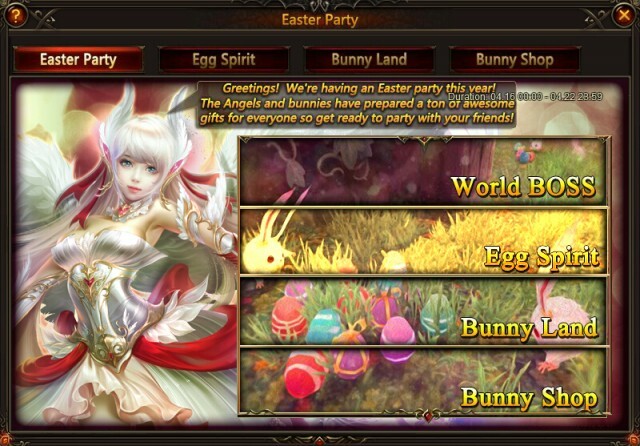 Click the icon of Easter Party and you will see four parts. They are World Boss, Egg Spirit, Bunny Land, and Bunny Shop. 1. 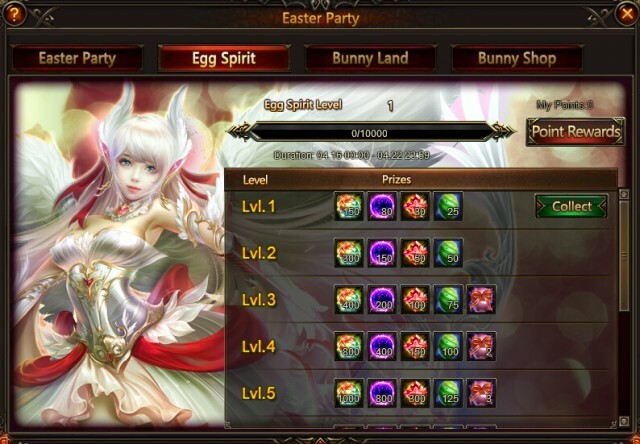 Easter party consists of four parts, World Boss, Egg Spirit, Bunny Land, and Bunny Shop. 2. Every Green Egg acquired will earn a player 1 personal point and increase the Easter Spirit's EXP by 1. Every Pink Egg acquired will earn a player 2 personal point and increase the Easter Spirit's EXP by 2. 3. All Easter Spirit level rewards can be collected once daily when available. 4. Join the World Boss during the event for a chance to receive Green Egg. The top 50 in World Boss ranking have a chance to receive Green Eggs and Pink Eggs! 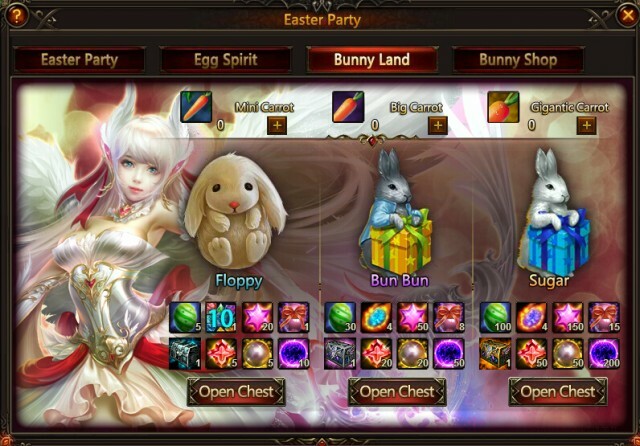 Resources, Teasure Hunt Chests and Eggs are waiting for you in the Gift Box holding by bunnies! There are 3 bunnies holding different gift boxes. You have to use Carot to feed them and then you can open the box. You can get carrots by achieving hot events, or purchasing by diamonds. You may ask, how to deal with the Eggs I have got? Ok, here comes a chance for you, to exchange items by Eggs! 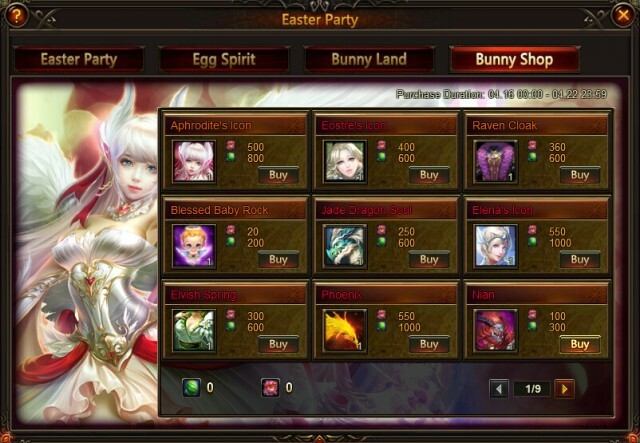 Here you can get mount Jade Dragon, Pheonix, Lumious Steed, new angel Aphrodite, Eostre, New Fairy Blessed Baby, New Clothing Raven Cloak, Elena, Smoldering Steed, White Kirin,, Varda, Seraphim, Divine Angel, Lover's Reunited, and many more powerful gems and other items! Description: Complete daily challenges to collect Pink Egg for Easter Party! Description: Complete daily challenges to collect Dumplings for Green Eggs! Description: Collect enough Eggs and Carrots to get rare items in Easter Party! Description: Cumulatively recharge certain amount to get excellent Gems, crystal, and Carrots! Description: Recharge certain amount of diamonds to get items for Easter Party! Description: Log in everyday to collect Mini Carrot! More exciting events are coming up through Apr 16 to Apr 22, check them out in the in-game Hot Events menu!